Bristol Rovers have signed Fulham midfielder Lyle Della-Verde on a month's loan. 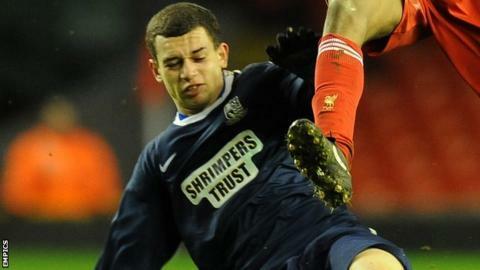 The 19-year-old joined the academy at Craven Cottage in 2011 after previous spells with Tottenham and Southend. Rovers have brought him in to cover for Andy Monkhouse, who is serving a three-match ban, and Jake Gosling, who has been called up for Gibraltar. "I mentioned him last season but we couldn't get him in," manager Darrell Clarke told BBC Radio Bristol. "I've watched him a couple of times and he's always impressed me. "He can play on either flank, has tricks in the locker and is very attack-minded. The kid's got potential so it's a good deal." Clarke has also been linked with a move for Forest Green Rovers striker Lee Hughes and Bournemouth forward Matt Tubbs, as he looks to build his Conference squad. When asked about the reports, the Rovers manager responded: "I know Tubbs - I played with him at Salisbury and I tried to sign him in the summer. "They're both very good players and I'm interested in good strikers. Those two certainly fit the mould."